When it was first introduced by young street dancers in New York City in the early 1970s, the distinctive art of break dancing, or B-boying, was widely seen as a nonglamourous, low-level style of street dance. Despite its absence from the mainstream pop culture spotlight, B-boying eventually made its way to Korea in the ’80s. For decades, however, break dancing was far from the mainstream and had just a small following among young, amateur dancers whose only opportunities to perform were on the streets and in subway stations. “When I first started B-boying in the late ’90s, not only was the dance form virtually unknown to most Koreans, it did not have a good reputation as it was thought of as a mere street hobby,” said world champion B-boy Kim Heon-woo, best known by his stage name Wing, during an interview Monday with The Korea Herald at the Jinjo Crew dance studio in Bucheon, Gyeonggi Province. “It was definitely not seen as an art form like it is today and it was not taken seriously by anyone,” he added. Wing, 29, started his B-boy career the old-school way -- there were no dance studios or stages available to aspiring break dancers. He studied moves by watching clips online and reading dance comics from the time he was 12 years old. He also performed on street corners and in subway stations in Seoul at any opportunity. With its intricate footwork, pops, locks, body contortions and high-flying acrobatics, the once-small niche of break dancing eventually spread across the country. Now more than 15 years later, Wing is a Red Bull BC One All-Star dancer and member of the award-winning Jinjo crew. He has won dozens of local and international competitions and is widely recognized as one of the most respected and influential Korean B-boys, having helped build up the reputation of Korean B-boy crews to now be considered some of the world’s finest. 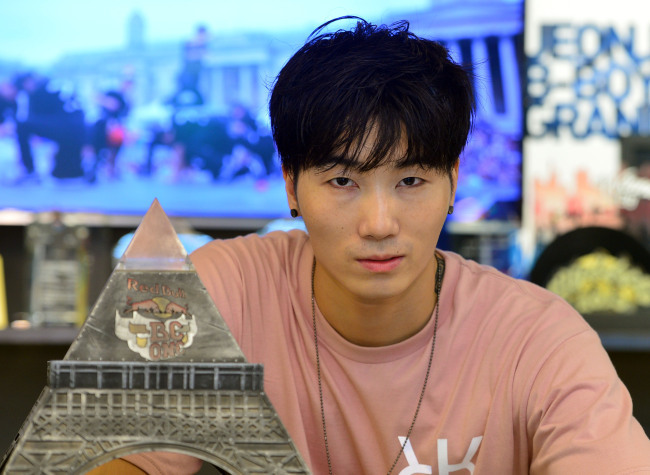 Wing got his big break after winning first place at the prestigious Red Bull BC One competition in Paris in 2008. Then in 2010, Jinjo Crew went on to win the Battle of the Year competition. They emerged as one of the hottest B-boy crews in the world and continued to win at major competitions across the globe. Since then, the B-boy craze in Korea has skyrocketed. It is now not only a well-recognized type of dance, but a popular form of entertainment enjoyed by both younger and older audiences, attracting local and international spectators alike. Today, there are countless nonverbal plays featuring interludes of break dancing and even plots based entirely on B-boying, including shows like “Ballerina Who Loved a B-Boy,” “Jump,” “B-boy Musical Marionette” and the popular “B-boy Kung,” the only B-boy musical in the world to have an exclusive theater. The country continues to make great strides in promoting local break dancing and creating an internationally recognized reputation for its pool of talented B-boys and fiercely competitive dance crews. Capitalizing on the dance form’s substantial popularity here, the Korean government established in 2007 the R-16 Korea, an annual international B-boy competition hosted by the Korea Tourism Organization and the Ministry of Culture, Sports and Tourism. Today, R-16 Korea is recognized as one of five major international B-boy competitions, enticing hundreds of high-flying B-boys to compete, including some of the world’s hottest and most talented crews, including those from the U.S., Taiwan, Japan, Australia, France, China and Russia. For his efforts in promoting the Korean B-boy movement both locally and abroad, Wing was awarded the Hallyu Hip-Hop Culture Award by the Ministry of Culture, Sports and Tourism in 2014. “So many times when I compete and perform overseas I would be asked by Western dance crews the secret behind why crews from Korea are so good. They tell me, it has to be Korean food, that there must be something about the Korean food we eat that gives us the body and agility that allows us to break dance so well,” said Wing. “I had never thought about it that way before. That’s not something I have ever asked myself as a dancer. But now I always tell people the secret behind our success is kimchi,” he added with a smile. This is the 17th article in a series that explores the driving forces behind hallyu and the global rise of Korean pop culture. -- Ed.